Hello everyone, and welcome back to The Arcane Sanctum. As many of you know I was recently on vacation. My trip took me to northeastern New York State (more specific Cooperstown), and to Boston before coming back home. That region is filled with a lot of history, and the subject of my trip was baseball. 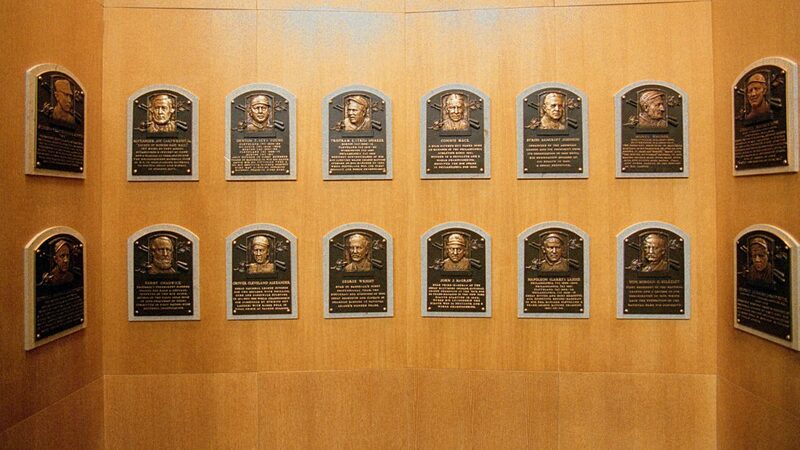 Cooperstown is home to the National Baseball Hall of Fame and Museum. Established nearly 80 years ago it houses many artifacts of America’s pastime within it’s walls. It also showcases not only the history of the sport, but also American history as well. In one of the sections a timeline showed the major events in baseball’s history along with important dates in American history, and it’s hard to ignore the impact the sport has had on life as we know it. Several legends of the game’s past are also highlighted within the hall. Many of these players are considered heroes of the game, and for those who have contributed to society off the field of play one can see why they are given such a distinction. Of course with me being the Magic player that I am I started thinking of the word Hero, and remembered this Standard deck from Magic’s past. This deck is every aggro player’s dream come true. Play creatures, protect them, attack. The Heroic mechanic was the backbone of the deck. Every time you targeted a creature with this mechanic something would happen. Either getting a free creature, putting a +1/+1 counter on that creature (or all of them), or providing it protection during that combat there was always some type of benefit. With the cheap cost of all the spells in the deck it had a high recovery rate if your opponent cleared the board providing the deck a level of inevitability in an efficient aggro package. During it’s time in Standard it gave a lot of Control and Midrange decks fits by being able to slip through opposing defenses, and go wide just enough to race the opponent to victory. At a cost of $27 this is by far the cheapest deck I have highlighted here, and in the form above could provide quite a surprise at your local FNM (and I encourage you all to do so, and let me know how it goes), however let’s take a look at some possible upgrades to the deck. As many of you know I usually play (true) control decks, or midrange, so I don’t feel like I’m an expert on aggro decks. With that being said it’s hard to look past these three for your deck. While Thalia, Guardian of Thraben does increase the overall dollar amount of this deck everything else remains relatively inexpensive. She helps keep removal spells in check with her taxing effect, and even makes Tron run a turn slower as it’s planeswalkers cost 1 more mana). Her lieutenant is a great choice for this deck as all of the creatures in the original deck are humans. The counters he grants, and receives, are all permanent growing your army to keep out of Lightning Bolt range quickly. Thalia, Heretic Cathar might seem like an odd inclusion here, but a 3/2 with first strike that slows your opponent down can do quite well with your pump spells as well as bonuses given from her lieutenant. We’re not done with adding humans yet. With Champion of the Parish getting a bonus for each human played it can grow to an threatening size in just a few turns requiring an answer rather quickly. Doomed Traveler provides a body (albeit not human) when it dies. This can allow you to block, or attack with it as the spirit it makes has evasion. Accorder Paladin may look odd, however I included it here not only as a budget option but due to it’s Battle Cry ability. You aren’t going to be blocking a lot with this deck, and often times an extra point or two of damage can be all that’s needed to determine a victory. The spells in the deck should focus on providing your attackers some combat tricks, however your opponent can get off to a strong start before you do. You may need to remove some of these creatures to clear the way for your team first. Lightning Bolt is not only the most efficient spell in the game, but also can deal the last points of damage to an opponent. You could even cast it on a Phalanx Leader to give your whole team +1/+1 counters if their blockers could kill your attackers (double this with Gods Willing for an even greater bonus). Bolt can not kill everything though, and sometimes you need another way to remove a threat. Path to Exile provides a way to do that, but you also ramp your opponent. It may not be great against every opponent so this might need to be a sideboard option. Rest In Peace is great here as you do not use your graveyard, but other opponent’s might. This should be an auto include in these colors. The mana undoubtedly gets better in this deck. Both Clifftop Retreat, and Inspiring Vantage really speed up the deck providing it mana to use immediately. Sacred Foundry seems like it can be an auto include, but with this being a dual colored deck it\s not a necessity. I would only play 2 here as you don’t want to damage yourself too much unless you have to. This is also why I did not include Arid Mesa here. Let’s take a look at an upgraded build. I personally use original printings when possible (good luck finding a good condition Beta Lightning Bolt), but there are cheaper reprints available too so don’t get discouraged by the price. Why should you play this deck? You want to turn creatures sideways. You are in the role of “the beatdown” anytime you play. You probably already have a Boros version of Death & Taxes built. You simply don’t like aggro decks. The Boros Legion has always been my favorite aggressive guild, and if I ever played an aggro deck I would start with this color combination as (to me) it is the definition of the archetype. That’s all I have for today. What do you think? Will you try this at your next FNM event? If you do let me know. Please also take a moment to follow me on Twitter as well as Facebook, and don’t forget to tell your friends. Next Everybody Was Jund-Foo Fighting. Those Plays Were As Fast Lightning (Bolt).